The Lamaze Gardenbug Foot Finder & Wrist Rattle Set puts tons of fun within your baby’s reach! This set of two soft wrist rattles and two foot finders encourages discovery and awareness of baby’s own extremities. 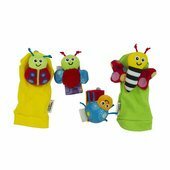 Cute colorful bugs wrap and rattle gently around baby's wrists, fastening easily and safely with Velcro tabs. Brightly colored ankle socks slip on easily so baby and bugs can enjoy each other's company. Enchanting rattles, contrasting patterns and bright colors stimulate vision, interaction and discovery. Baby-soft materials are safe for baby to chew. Lamaze inspires daily discoveries through toys created with delightful surprises that encourage baby to learn while playing. Packaged in a deluxe gift box.